Hurricanes Taking Lessons From '74 Caps? Hurricanes Taking Lessons From ’74 Caps? Are the Carolina Hurricanes taking lessons from the 1974-75 Caps? Fans of the Carolina Hurricanes hope they’re not. Here at the 2-week point of the season, amazingly enough, this is a valid question. I for one thought that the ‘Canes would have a win by now. The current swing through western Canada seemed to offer (on paper) legitimate opportunities to get a win and some points. But, the win column remains empty for this season’s Hurricanes, and until they prove otherwise, may remain empty for some time. Tuesday night they will skate against the 5-3 Vancouver Canucks, winding up what could have been a productive 5-game road trip. The Canucks are 5th place in Pacific Division, with 10 points so far on the season. They are coming off a 4-2 Sunday night victory over the Washington Capitals. The Hurricanes are 0-5-2 with 2 points. Their last outing was Friday night in Edmonton, a 6-3 Carolina loss. Why would one ask if they’re taking lessons from the ’74 Caps? For you hockey history buffs, the answer is obvious. For the rest of us, let’s review: The 1974-75 season for the newly franchised Washington Capitals is viewed by many as the “worst hockey season ever” in the NHL. Their season was less than stellar to say the least, having gone a stout 8-67-5. They racked up 21 points, and only won 1 game on the road. Their winning percentage – was .131. Now consider this season’s Carolina Hurricanes. With an 82 game schedule, 7 games is approximately 8.5% of the season completed. 2 points extrapolated out for that percentage would equate to approximately 23 points. Whew! The ‘Canes might not be taking lessons from the ’74 Caps after all. Losing is like a snowball. The point is that if a team is gripping, which the ‘Canes certainly are, then the mental part of the game can snowball into continued losing. Like a snowball, it builds on itself. The Hurricanes need to win to keep this from getting out of control. If they don’t, asking if Carolina is taking lessons from the ’74 Caps may begin to become a valid question after all. I think everyone certainly thinks they can and will. In their defense, they have yet to field a full-strength squad on the ice this season. 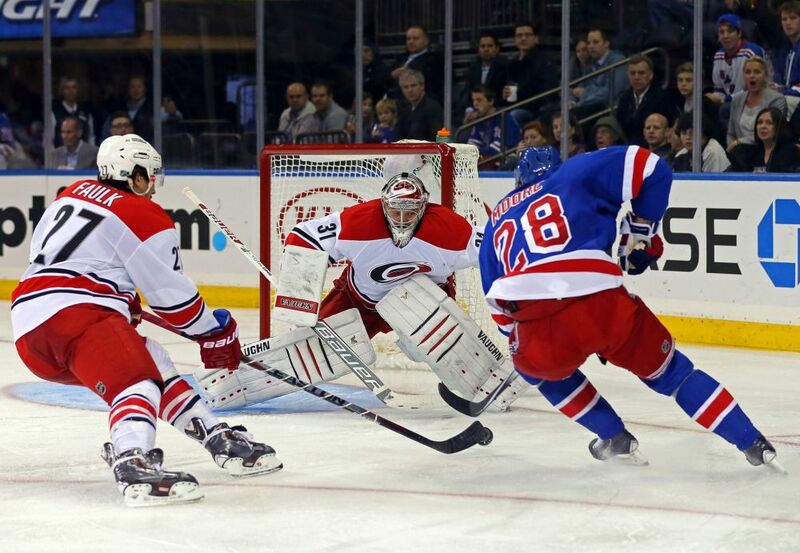 According to the team, Captain Eric Staal will be back against Vancouver. Nathan Gerbe is possible for the Vancouver tilt, but likely for Saturday night’s game versus the Arizona Coyotes. These are 2 veterans, 2 key components of the team. Staal is considered a superstar in the NHL, and Gerbe is, in my opinion, the hardest working member of the Hurricanes team. I have never seen him coast on a shift. Never. One has to think that getting all the pieces back in place on this team will help them get into the win column. The ‘Canes need Elias Lindholm and Alexander Semin to score. They need offense in a big way. They have 14 goals in 7 games. They have 2 points. Jeff Skinner got his first goal last Friday against Edmonton. Lindholm, Semin and Staal hopefully will follow suit and get this team productive offensively. There is a problem looming that may be equally as detrimental to the team as the injuries. The goal-tending has been horrendous! Mark Jones of The Bleacher Report posted October 25th, “League-Worst Goaltending Key Culprit for Carolina Hurricanes’ Disastrous October.” I won’t reiterate his content here, but simply point out that both of Coach Bill Peters’ potential “studs” are not performing like thoroughbreds. We in the pundit world have tried to be patient with the tandem – especially with Cam. get to Wardo or Doby. And that is true – to an extent. But at some point one of these guys needs to stand on their head and get the job done. Act like you’re worth $6.6 million, Cam. Be the stud, Anton. The defense has not been strong, but that rationale is not going to negate the fact that both of Carolina’s goalies need to elevate their games to a higher level. The “snowball” that is losing could be easily melted by a top-notch performance by either or both of the Hurricanes’ goalies. Against a strong Vancouver team – in Vancouver – would be an excellent time to show up and lead this team to a win. Make the a strong statement that the ‘Canes are not taking lessons from the ’74 Caps.